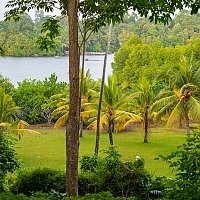 Set on a belt of coconut plantations 500m inland, the surroundings are peaceful woodland. 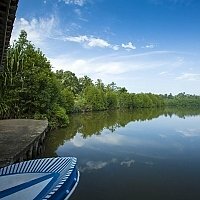 The forest hosts many birds, and you may make an interesting visit to the nearby prawn farm on the river that borders the garden. An excellent opportunity to join friends in stylish and spacious suites and be waited upon by any of 15 discreet and extremely professional staff, attending to the garden, housekeeping and dining. The colourful and symmetrical style blends natural stone and wood with a profusion of Asian antiques. 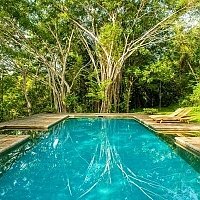 Relax in your private Jacuzzi under the stars, stroll down to the pavilion and take a dip in the glistening pool, or explore Ambalangoda's antique labyrinths for Sri Lankan mementos. Travel up river in your private motorboat,cut the engine and reach for your fishing rod. 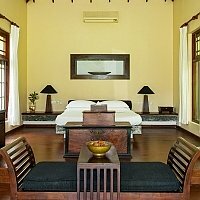 Colonial style verandahs wrap around the villa, furnished with crisp white and navy sofas. Bowls of fresh mangos are placed temptingly below the archway windows. 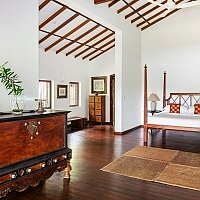 White on white walls and tranquillity fish ponds calm the mind as soft music prepares the body for an ayurvedic massage in-suite. Jaffna temple doors have been individually sourced to sound proof each suite. 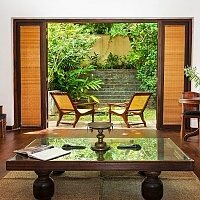 The main villa comprises 4 suites and a further single bedroom ideal for a solo traveller. 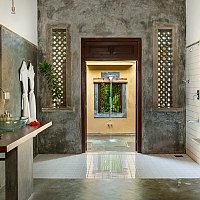 Beside the river bank is a separate villa - ''The Walawe''� : whose polished cement floors throughout are softened by South Indian rugs and furnished with teak, maron and jackwood furniture hiding essential Western luxuries - fridges, coffee/tea facilities, TV & DVD. Remote-control air conditioning with optional fans. Private balcony/terraces offer magnificent views across the river into a private landscaped rockery garden and fish pool. Natural stone, mirrored vanity suites and porcelain tiles add an essence of comfort to outdoor spas and indoor washrooms. Warm hues on the bedroom walls are complimented by dramatic bed heads and subtle lighting, Indian bed throws, silk cushions and delicate Buddhist figurines. Zodiac room names represent the colours and textures of the Island. 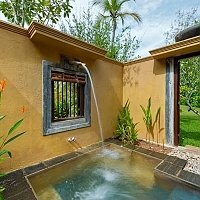 The Menik Suite�: Occupies the entire upper floor of the main house and has the best views of the 7 acre estate, river and a huge terrace which includes a large plunge pool with jacuzzi jets. A rare Kumuk wood floor creates a warm setting for a four poster king size bed and a day bed , enabling a family to share. 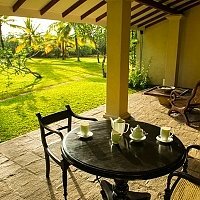 Garden Suites "Kala/Kirinda"�: Two large suites with private garden and rock pool. A comunicating door can be opened for families to wander. A serving hatch opens and a private butler is on hand should you choose to dine or take cocktails in the room. 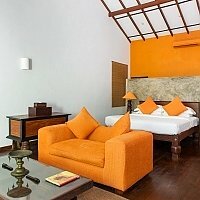 "Gin Suite"�: Spacious room with a semi private garden overlooking the river and lawns. A kingsize bed dressed in rich red and purple linen, cushions and sofas to match. An interesting collection of miniature brass antiques. The well appointed shower room and open air-jacuzzi with shuttered windows looking out to the garden. 'Walawwe suite"�: located 60ft below the main house, close to the river. 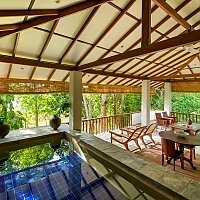 Very secluded and surrounded by coconut trees, it has an open verandah from which to admire the sunset`s glow behind the main house. Black and white decor with stone figurines and temple wall hangings. To the rear of the villa is an indoor shower room and open air plunge pool overlooking the river. 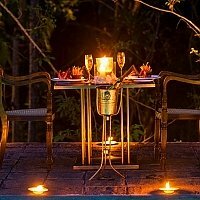 Ideal for romantic couples. if the Menik suite is not available. Private terraces, open verandahs, a dining terrace and the pool pavilion provide flexible locations for that celebration, intimate dinner or lunchtime snack. Whatever the location, the presentation, service and menu is first class. The managements's hand-picked chef, has great skills but a flexible attitude. Personal favourites are always built into a menu. Seafood has a big influence but each day has its own flavour. 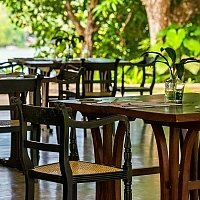 The emphasis is on genuine Sri Lankan cuisine that exploits the great produce and spices of the island. Every meal will bring its own character but filet steak and smoked salmon will not be found at River House. Continental flavours and produce can be integrated to suite the western or timid palate. A snack menu of pastas, salads and bites is also available for lunch or light dinners. Guests are invited to stock up with wines at Duty Free or before leaving Colombo if they have specific requirements. The Balapitiya beach is narrow and rocky. Swimming is not safe because of the undercurrent, but sunbathers and strollers will enjoy the sunsets. A complimentary private liveried tuk-tuk is at your service - head for the beach, village shops or anyway of your choosing in a 5km radius. Drivers can be arranged for excursions further afield. Balapitiya, Bentota and Ahungala are famed for their boat trips up the Madu Ganga - catch baby crocodiles basking in the swamps. Venture into the caverns of Ambalangoda's many antique stores. Negotiation is key as these collectors have 3 price structures - local, tourist and greedy. 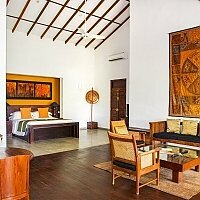 Broaden your knowledge in Galle's historic Fort, brimming with museums and galleries. 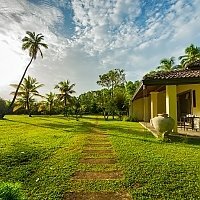 Stroll along the ramparts as sun sets and retire with cocktails or tea - a tone of Galle's many boutique hotels. 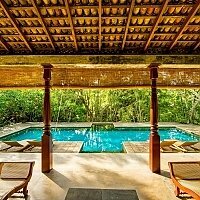 Waterbabes can escape to Bentota's River for activity, anything from jet skis to wakeboards. 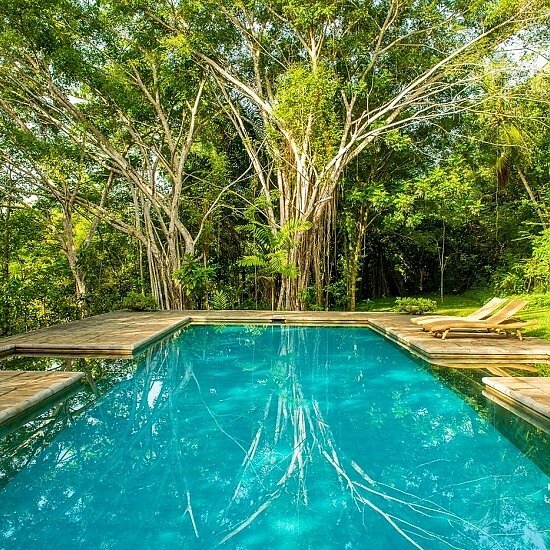 Bevin Bawa's Brief gardens and brother Geoffrey's architectural haven "Lunaganga" will enthrall house and garden lovers in Bentota. Head south to Unawatuna for snorkelling and diving in the bay. 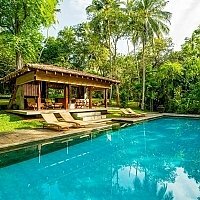 Yala Safaris, Sinharaja Rainforest or Ratnapura gem mines are longer excursions (1-2 days) and chauffeur driven cars can be arranged . 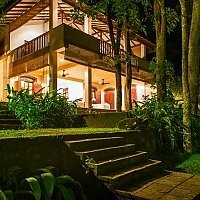 The Cultural Triangle and Kandy are further afield and justify staying in a guesthouse or moving in to a plantation bungalow or boutique hotel in the Hill Country for a few days. Ancient Buddhist temples pepper the South West Coast but Balapitiya is predominantly Muslim and tourists are not welcome at the mosques. For our recommendations on places of interest, activities, restaurants and local transport around Balapitiya, click here.